"She was Gidget, and she was Tammy, and for a time she was young America's ideal," film historian Leonard Maltin once said of her. 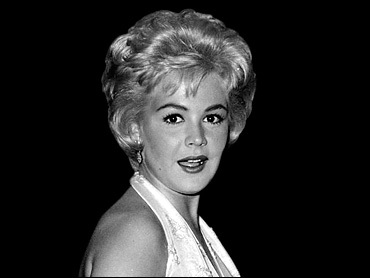 Dee married another pop icon, singer Bobby Darin. Dee died of complications Sunday morning from kidney disease at the Los Robles Hospital & Medical Center in Thousand Oaks, her family said. She was 62. Steve Blauner, a longtime family friend who represents Darin's estate, said Dee had been hospitalized for nearly two weeks. She had been on dialysis for about four years, Blauner said. "She didn't have a bad bone in her body," he told The Associated Press on Sunday. "When she was a big star in the pictures and a top five at the box office, she treated the grip the exact same way she treated the head of the studio. She meant it. She wasn't phony." With her squeaky-clean image and girl-next-door charm, Universal Studios cast Dee mostly in teen movies such as "The Reluctant Debutante," "The Restless Years," "Tammy Tell Me True" and "Take Her, She's Mine." Occasionally, she landed secondary roles in more mature films, such as "Imitation of Life," "A Portrait In Black" and "Romanoff and Juliet." Dee later made an independent film "Rosie!" (1968), starring with Rosalind Russell, and did a number of TV movies and guest appearances - including "Fantasy Island" - in the 1970s. But she never recaptured the stardom of her teenage years. Her last film credit was for the 1983 movie "Lost." In 1960, Dee married Darin in Elizabeth, N.J., following a one-month courtship. A son, Dodd Mitchell, was born the following year. Born Alexandra Zuck in Bayonne, N.J., on April 23, 1942, Dee became a model while in grade school. In a mid-career interview with The Associated Press, she explained her name change. "I used to sign vouchers and sign-out sheets with 'Alexandra Dee,"' she recalled. "Somehow it stuck and when (producer) Ross Hunter signed me to my first picture ... 'Sandra Dee' was the name they gave me." Her name was resuscitated in 1978 with the film "Grease," which featured the song "Look At Me, I'm Sandra Dee" that mocked her wholesomeness. But Dee didn't mind, Blauner said. "She always had a big laugh about it. She had a great sense of humor," he said. Blauner said her favorite films were the ones she made with Darin, adding that the singer remained the love of her life despite their divorce. Darin, who had rheumatic fever as a child, died following heart surgery in 1973. He was 37. In 1965, with her divorce from Darin dampening her teen appeal, Dee was dropped by Universal. "I thought they were my friends," she said in a 1965 interview with the AP, referring to her former bosses. "But I found out on the last picture ('A Man Could Get Killed') that I was simply a piece of property to them. I begged them not to make me do the picture, but they insisted." Actor Kevin Spacey, who portrayed Darin in last year's biopic "Beyond the Sea," in which he starred and directed, said Dee had seen the movie and approved. "She called me last week and said she loved it," Spacey told an interviewer last year. Actress Kate Bosworth, who played Dee in the film, said at the time: "She had this image, but she was so tragic and lost and naive and she could have had such potential to tap into that - but nobody gave her the chance."